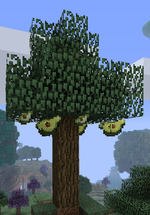 Avocado is a block added by the Pam's HarvestCraft mod. It can be found attached to the bottom of the leaves of trees. Avocado trees look like normal Oak trees with the block hanging from the leaves. Avocado trees can be grown with Avocado Saplings. When the blocks ripen they can be broken, giving the player an Avocado and reverting the block to its original state. Avocado blocks can also be completely removed by breaking an unripe block, which also results in An avocado dropping. Avocado (Block) has no known uses in crafting. This page was last modified on 18 May 2016, at 18:17.